This issue doesn't undermine the importance of substring method, which is one of the most useful methods from java.lang.String class. One thing, which is also worth remembering is that, whenever you call substring method, it return a separate String object, because String is immutable in Java. In next section, we will see the syntax of substring method and How to use it for practical purpose. Remember substring(int beginIndex) method will throw IndexOutOfBoundException if, an index is less than zero or more than length of String. While substring(int beginIndex, int endIndex) will throw IndexOutOfBoundException if beginIndex is negative, or larger than endIndex or end > length(). 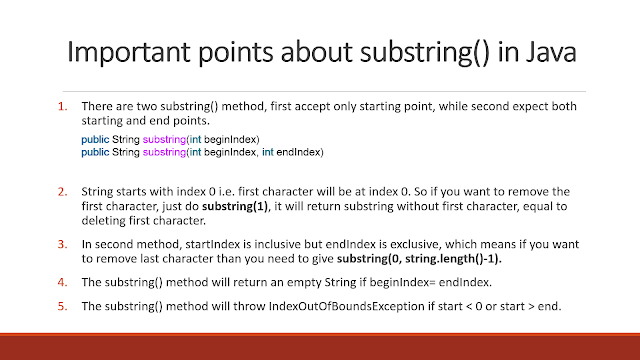 It's also worth knowing that substring will return empty String if you pass the length of String as a start in the first version and same index as start and end in the second method, as shown in our substring example in Java. There are two substring() method, first accept only starting point while second expect both starting and end points. The string starts with index 0 i.e. first character will be at index 0. So if you want to remove the first character, just do substring(1), it will return substring without first character, equal to deleting the first character. In the second method, startIndex is inclusive but endIndex is exclusive, which means if you want to remove the last character then you need to give substring(0, string.length()-1). The substring() method will return an empty String if beginIndex= endIndex. The substring() method will throw IndexOutOfBoundsException if start < 0 or start > end. That's all about substring in Java. we have seen How to use substring to create smaller String from a big text. We have also compared two overloaded version of substring by different substring examples, and also touched based on memory leak issue due to substring, which is now fixed in JDK 1.7.